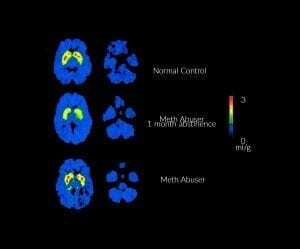 Addiction is a chronic relapsing brain disease. How can you say it isn’t? Think about this because this single point is enough to tear apart the brain disease model as it is regularly presented. 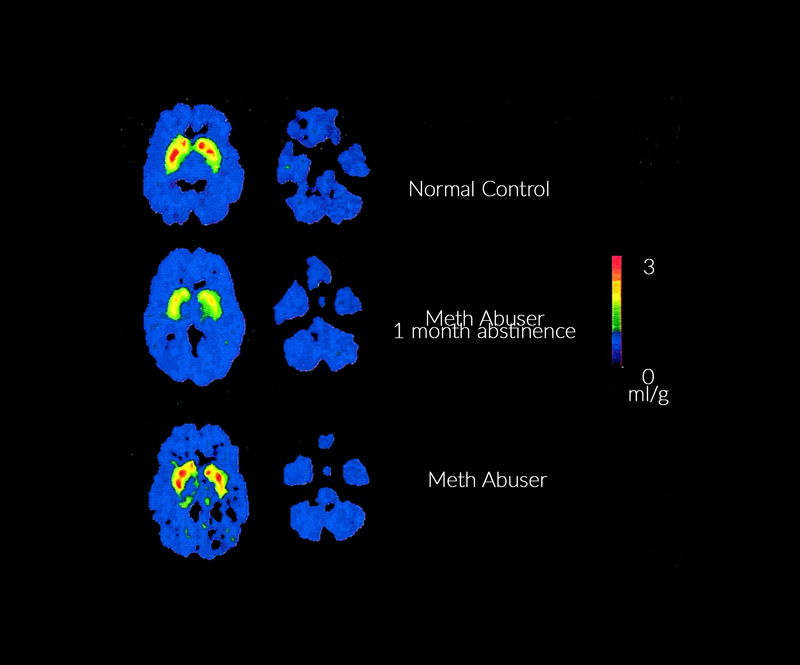 If we are to believe that the brain state labeled as “Drug Abuser” in Figure 1 causes “addicts” to use substances “compulsively” (without any choice in the matter and unstoppably), then those users would not be able to stop until their brains had been altered to once again look like a “Healthy Control” brain. 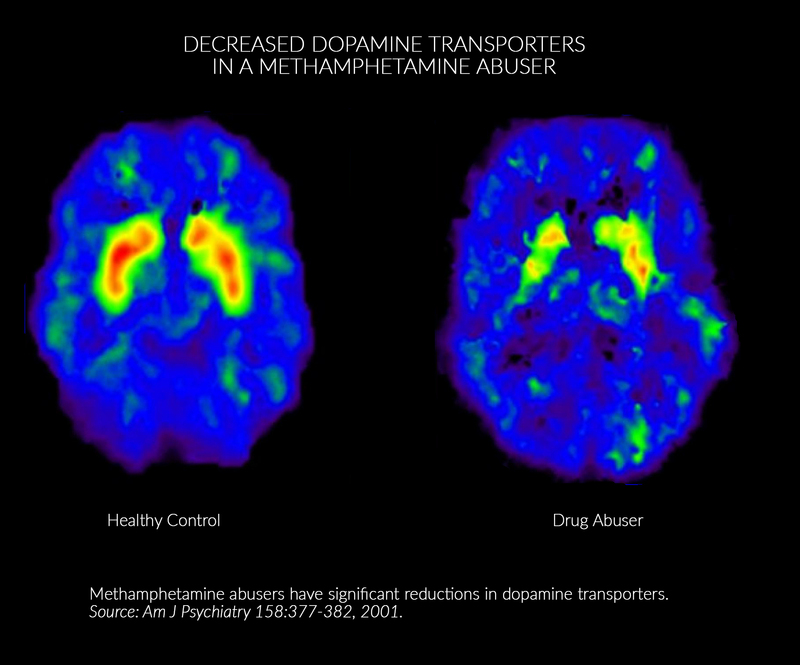 However, they do stop usage, even while having a supposedly “unhealthy” and “addicted” brain, as shown in the scans of Figure 2. 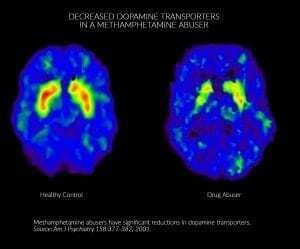 The “powerless addicts” in this very study were not powerless at all; they stopped using methamphetamine while they were in the purported diseased and powerless state. Furthermore, they did not have a scalpel put into their brains to surgically alter it, nor were there any medications used at the time to alter brain activity related to meth use. The subjects of these studies were gathered from run-of-the-mill treatment programs, where the treatment likely consisted of group counseling and 12-Step meetings, among other nonmedical, talk-based treatment. Talking doesn’t remove tumors. Talking doesn’t restore dopamine function to Parkinson’s patients. Talking doesn’t eradicate infections or change insulin levels. Talking doesn’t make a paraplegic’s legs work. But we are asked to believe that talking made the “diseased” subjects able to stop while they were still supposedly diseased! How can that be true when the disease proponents’ main criterion for the disease is that the subjects cannot stop while in the diseased state? You can clearly see that their rhetoric backfires and exposes the ruse. Conversations aren’t medical treatment. They are human interactions in which ideas are communicated. Ideas. Those ideas may persuade people to behave differently and to make different choices, but the premise of the brain disease model of addiction is that addicts’ brains prohibit them from making different choices about drug and alcohol use. Yet here we see in NIDA’s main piece of evidence for their brain disease model of addiction that “addicts” (of what we’re told is one of the most “addictive” substances) do make different choices even while their brains are in an unhealthy/addicted state. What this brain scan data demonstrates is a correlation. When people have been using heavily for a significant period of time, we see these brain changes. When they cease using heavily for a significant period of time, we see these changes go away. That is correlation: “a mutual relationship or connection between two or more things.” The question that could point us toward a potential answer about causation would be about which comes first—the brain changes or the behavioral changes? The data above shows us that the significant brain changes come after behavioral changes. This doesn’t answer everything, but it does negate the notion that addicts are prohibited from stopping substance use without a medical intervention.